Thank you to everyone who attended the Central Florida Android Developers Group last night. Special thanks to Echo for hosting the event. I had the opportunity to talk about how to easily integrate photo capture capability into one’s app by leveraging the built-in Android camera app and Intents. Last night’s presentation was an excerpt from the first module of my Android Photo and Video Programming course. You can download the code from last nights discussion. The download includes the Photo capabilities we discussed and also includes Video capability, which we didn’t have time to discuss. Please feel free to post any questions you might have. 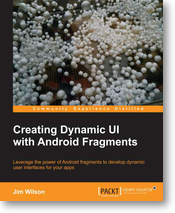 For more information on this and other Android-related topics, checkout Jim’s Android courses at Pluralsight. What was once thought impossible just happened: Android has displaced iPad as the dominant tablet platform. As reported by IDC, Android took the tablet market by storm in Q1 with over 56% of the market. During that same period iPad dropped below 40% market share. Given Androids already overwhelming lead over iOS on Smartphones, it appears that Android is now the undisputed leader in all-things-mobile. Checkout Jim’s Android developer courses for Pluralsight. Ok so this has to be among the silliest UI “innovations” I’ve encountered. After updating my phone, Samsung Galaxy Nexus, to Android 4.2.2, I could no longer find the Developer Options menu. And here’s why … Google seems to have decided to no longer make that menu visible by default. We can argue over why they made such a change ( my guess is to make the developer options less accessible to non-devs ) … but whatever the reason, it’s a pain. As you do you’ll eventually see a message something like “You are now X steps from being a developer” … continue to tap until the “Developer Options” menu become visible. Checkout other Android Developer related information from Jim in his courses from Pluralsight. I spend most of my time creating Android apps using Java and the Android SDK. That’s a development style that fits my experience and interests. I encourage you to check out Practical PhoneGap. I’m so excited about this course going live and to make it even better, the Pluralsight blog even quotes me on my excitement about this course. With Smartphones, access to the camera is so pervasive. Don’t miss out on providing the richest possible user experience by not including camera behavior in your apps.